Crash is back and what better way to celebrate then returning to N. Sanity Island on another adventure with our orange friend. Crash Twinsanity is a very interesting game, as it is both one of the biggest steps forward for the franchise but at the same time, one of the most creative platformers out there. Everything it does has roots in something else, but the game has this thick crazy layer on top of it all; making it feel so fresh at the same time. Lets take a trip inside this amazing madness produced by Travelers Tales Oxford and see how it holds up. I’m going to be honest here, I could make this entire Retrospective on the history of this game alone with how much there is to the game. 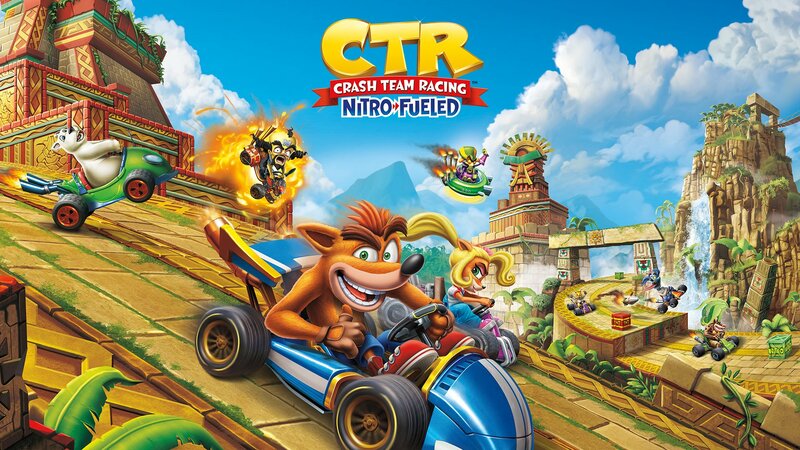 Crash Twinsanity started life as a sequel to Crash Team Racing, with newly formed studio Travelers Tales Oxford working on the project. It was going to originally star a new character called Nina Cortex, but there version of the game was scrapped when Vicarious Visions took over the project. After moving on to making a new mainline Crash adventure, they had large goals for the project. The worlds were going to be more open, Crash was going to go into space and it was an evolution. So much so, the game WAS called Crash Evolution and it was going to be a big step forward for the series. The plot was going to have an alien ants come invade the world and Crash goes across the galaxy to stop them. Crash was going to have an alien buddy on his arm help him out to solve puzzles and get new powers like grabbing on points in the world. Crash was also going to explore worlds not unlike the Zelda series and have a lot of different NPC’s asking you to help them out. This was a massive game, but they decided to completely rebuild the project. Why? Ratchet & Clank; it was very similar to the concepts Crash Evolution set out to do. This pushed the team to retool the game completely into something; Twinsanity. 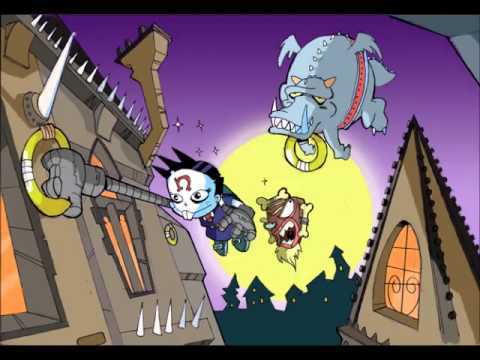 Twinsanity started its shift into a different title but a few key things remained from Evolution. 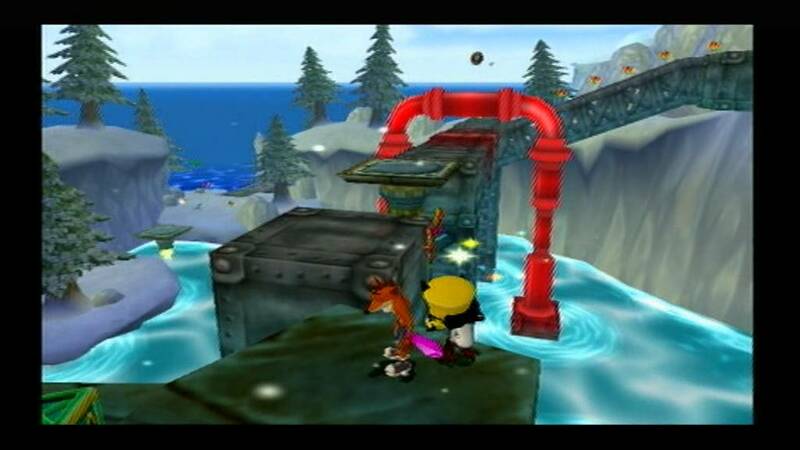 The swinging mechanic evolved into a new character, some locations were used in different contexts and some of the plot remained with Cortex working with Crash. But the game turned into something very different. Travelers Tales Oxford got writers from Invader Zim and Ren & Stimpy to pen the story, they got Spiral Mouth to compose the games soundtrack and the goal of having a open world Crash was present. Will get to that in the gameplay portion soon enough though. Lots of creative level concepts were thought of while development started, with Crash exploring underwater in a scuba suit, riding on Cortex’s back while he uses his hover craft, Coco hacking in Cortex’s Castle, and climbing up a massive tree as Nina Cortex while avoiding attack. The game released in 2004 and it got decent scores. Many Crash fans consider this to be the best post-Naughty Dog game in the series and its reputation of being a solid title despite being rushed is a shining point to the quality TT Oxford put into the project. Some words from the developers….. I was able to get former TT Oxford Developer skullomania to answer a few questions I had about the game and here are the questions & answers below. Thank you so much for answering my questions! 1) What was your inspiration behind the Academy of Evil Location, as it is so foreign to any world in the Crash series. Answer: Basically, in the over-arching story for Cortex, we wanted to solidify some of his past (as there had been snippets referred to in manuals and game guides from earlier games, but nothing solid). Once the idea of an Academy of Evil was introduced to the backstory, it looked like a good location to put in the game, from a visual perspective, as it’s dark corridors complimented the light jungle areas of the first section of the game. Some of the inspiration for the Academy of Evil’s architecture, came from the UK city of Oxford (where the game was developed) to give it that slightly Gothic feel. 2) What was there going to be more Doc-Amock style stages? As the final game only has two of them and I remember reading up on one where a shark was on Cortex’s head. Answer: I certainly recall a level in development, which was based on a dry ocean floor. I believe this was going to be based in the 2nd dimension (see question 8), where the islands were still there, but all the ocean had drained. I recall it was originally going to be called “Ocean Commotion” (but that name may have been used elsewhere, later). That stage certainly was going to involve doc-Amok style stages, with an Octopus attached to Cortex’s face, and then later the shark! this was planned out in notes, and designs, but I don’t recall it ever making it to the prototype stage. 3) Was Evil Coco going to be a more critical character outside of her scrapped cameo? That sample cut-scene of that was really funny. Answer: I can’t remember exactly who came up with Evil Coco’s design. It was likely the lead character modeler, but the idea for evil Coco would have come from the lead designer. I’m not sure if she was going to be used elsewhere, other than the cut scene. (I think she was also referred to as “Hot Coco” during development 😉 ). She was definitely built as a 3D model, but possibly not rigged or animated in time, hence her being cut out. 4) Out of all the different gameplay mechanics, what was the one you had the most fun working on. I personally loved the snowboarding levels. Answer: I liked the snowboarding stages, and the Doc Amok stuff. As I was the concept artist (well one of them), I was also asked to sketch out a few other mechanics for the RollerBrawl stages (where Crash and Cortex are fighting in a ball of dust), so I believe there were designs where they would get gobbled up by Venus fly traps, spat out, and then a few pinball like mechanics would lead off from this. I think this was to be based in the Totem village stages. 5) What is your inspiration behind the art style of the game? It is so striking and unique, but at the same time fits the core Crash style Naughty Dog created. Answer: Before I joined the team, a couple of the other concept artists before me had a few different styles pinned down, which were possibly more Ratchet and Clank inspired. I really liked the Charles Zembellis sketches, so I tried to emulate that style, but eventually just added my own cartoon style into the mix. I wanted to make sure all the concept art was colourful and had a sense of fun! 6) Out of all the games in the Crash series, which one was the greatest inspiration for Twinsanity? Answer: I think we took elements from each for inspiration. Possibly Wrath of Cortex was the “least” inspiration for Twinsanity (it was actually made by a completely different Travellers Tales team than us) and we felt it lacked heart and humor, so I think we tried to distance ourselves from it. We definitely took story inspiration from all of them though, and put in little references from old cut scenes and the like. 7) Was there plans for 2D Animated Cut-Scenes during development? As the concept designs for the cut-scenes you can unlock in from collecting gems look fantastic and I could see them animating beautifully. Answer: No, I think the cut-scenes were always going to be in 3D. I draw all of the storyboards that you saw in the extras and unlockables, but some of them I actually drew after the cut-scenes had been completed by the animators, so that we had the whole story in story board form if we needed it. We had a great team of 3D animators, but no real 2D animators (apart from myself, I guess) and I think it would have taken too long! In regards to the storyboards, here’s an interesting factoid – After the game was mostly complete, Vivendi-Universal wanted us to get it ready for the Japanese market. One of the location team looked at the unlockables, and noticed that in most of the art that I did, there were only 3 fingers on each character’s hand (a la western cartoon style). they panicked, because one finger missing in japan has ties to the Yakuza. I then had to go through all the storyboards, and add an extra finger on each hand in all of the storyboards for the Japanese version! It took ages, and most other members of the team had finished by then! I’m pretty sure if you can find a copy of the Japanese version you should be able to see the extra fingers I added in the unlockables! 8) Was there plans for another world in the final game? As Cortex makes a comment about ‘There were going to be two dimensions….but we ran out of time’ before going to Twinsanity Island. Answer: There were certainly going to be 3 dimensions at one point. All I can really recall was that the second one was basically the islands, but with no ocean between them, so you could walk across the dry ocean bed. There was likely a lot more than that, but I can’t really recall much more detail than that. 9) How did you come to the idea to use Spiral Mouth to compose the games music? It is such a interesting choice and one I think paid off; personally love Twinsanity’s soundtrack. Answer: Vivendi-Universal contacted Spiral Mouth, and created all the music, so we didn’t really hear it until it was all done. I remember the team really liking it though, and it fit really well with the style and humor of the game. I do recall we had the testers over at one point in the office, and they sat right next to me whilst I was creating some concept art. They were replaying the first stage over-and-over again looking for bugs, and therefore for weeks at a time, and 8 hours a day, I heard that first stage music over and over again (I think I got sick of it after a while). 10) My last question: if you could make a sequel to Twinsanity, what would you change or improve upon from the original. Answer: I would love to work on a sequel to Twinsanity. The thing about the first one that made it great, was that everyone involved basically just chucked ideas in and ran with it. Most of the ideas contradicted each other, but we didn’t care…just created a big heap of craziness and hoped it worked (which it seemed to do). Course their was lots of in-fighting because of that, but it was all part of the creative development process. I’m not sure if you could plan that in to a sequel, as it all just sort of happened, so it would be good to get the old team back together and see what randomness occurs. 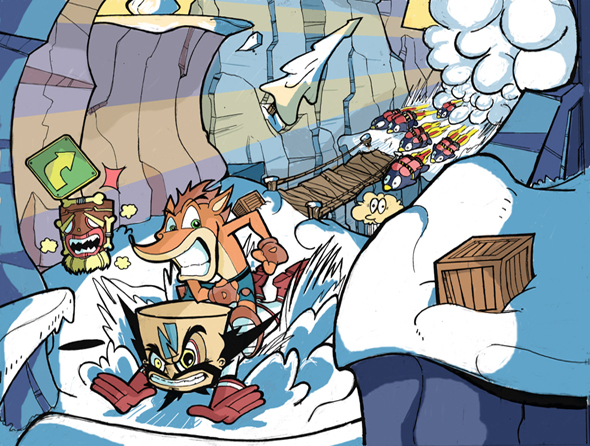 One Day , On N. Sanity Island…..
One day on the calm islands of Crash’s home, Cortex and Uka Uka are free from the frozen prison that they were inside after the events of Crash: The Wrath of Cortex. Cortex out for revenge, gathers all of Crash’s foes and they work together to take him out. But, Cortex first freezes Coco in place to….take her….cloths. And, he puts them on…..himself. Despite how horrific he looks as a woman, Crash after digging his shoe out of the ground, he sees Cortex and he tells Crash to follow him. Crash doesn’t realize that ‘Coco’ is really Cortex but he is a bit dumb, so its understandable. 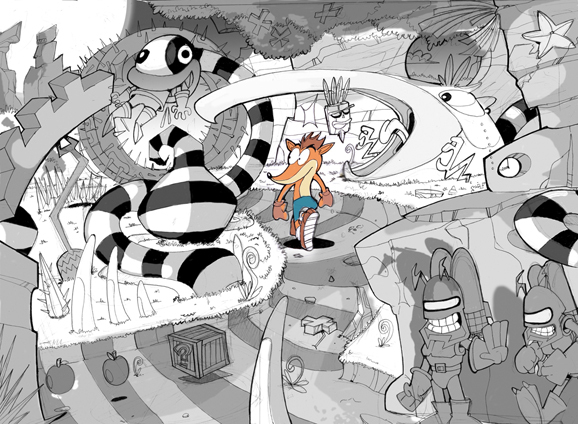 After running through N. Sanity’s Jungles, he walks into Cortex’s trap and after fighting him and MECA BANDICOOT, both fall into the caves of N. Sanity Island. After getting into a cartoon brawl (which you control, by the way) and things just keep getting crazier as the game goes on. Its humor is right on point in many cases, with jokes at the past series, smart writing and some really great times where the humor & gameplay perfectly mesh together. The story does have a few holes, like Coco being frozen in place the whole game and doing nothing but overall, I laughed hard at the games plot. One thing I forgot to point out, a purple dragon wants his jewels back. Gameplay old, but new at the same time…. Crash Twinsanity is very smart. I say that, as it uses core gameplay systems you saw in many other titles but does so in such creative fashion. But lets touch on basics first. Crash does everything you expect him too; can spin like a top, slide kick into foes, belly flop, long jump and double jump. Crash does get some new abilities, mainly having the ability to interact with the world around him. This means you can roll around balls, rocks and more in the levels and spin/kick them into other objects. This allows for level design that can have puzzles for Crash to solve and many cases in the games four hub levels, you use this added interactivity to collect colored gems. But we have traditional Crash-like levels at some points in the game but most of the time, the platforming is similar to stuff like Jak & Daxter; semi-open levels that have a clear goal in sight. 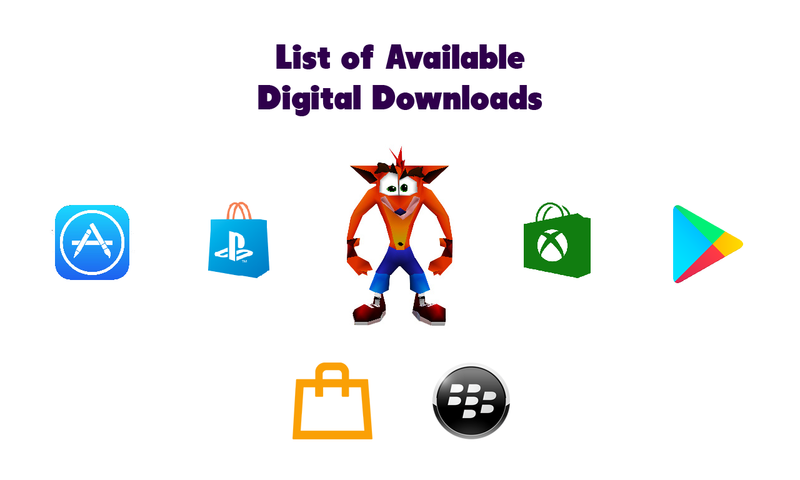 Unlike Jak though, Crash Twinsanity’s levels aren’t as open but it does carry the games no-loading screen and rock-solid controls mentality across the board. What makes the game special is how what many would consider traditional ‘gimmicks’ are brand new at the same time. Crash can snowboard…..but its on Cortex’s back. You can grind on rails too when riding on Cortex……..man, that HAS to hurt….. Anyway, Crash & Cortex can roll into fight at two points in the game and they control like a Monkey Ball or the Ball Levels of Wrath of Cortex. But the difference is the context; Crash and Cortex are fighting when in a cartoon ball. This makes things really funny and fresh despite it being same at once. You also work with Cortex in a traditional way too, with having the ability to spin into him and getting the ability to do a lot; throw Cortex across gaps, have a stronger spin attack, and slamming his head into the ground. But Crash isn’t the only playable character; Cortex and his Niece/Daughter Nina Cortex. The former isn’t really that special, as he has a short hop and shoots using ammo. Cortex can also slam his own face into the ground for an attack and charge his blaster shots. Nina has robotic arm, so she can grab and swing on objects like Crash could in the original versions of Twinsanity. She is sadly only playable twice in the game, but she controls similar to Crash and her level is very close to what one would expect from a Crash game. Level designs here are well done, playing to the series strong points (hallways, short levels, lots to collect/see, creative gimmick portions at the right points) but some levels are larger then past titles. One creative level the final one, with it being a challenging set of platforming sections before you fight the final boss. It uses the interactive abilities Crash has and the colored platforms you jump on appear/vanish at set points. This makes platforming across these enjoyable and rewarding when you beat the level. The game also has some different level types though. The Doc-Amock levels (two of them) have you defend Cortex by removing things in his way through blowing up TNT Crates, spinning into objects, pressing on switches and more. They are very close to the Crash levels from the PS1 Era and are a highlight of the game. Snowboarding with Cortex is great, as the controls are tight and work very well. You also have the Roller-Brawl (Cartoon-Ball Sections) that only happen twice in the same level but they are fun. Unlike in Wrath of Cortex or Warped, these ‘gimmick’ levels have less screen time (30-40% of the game) then the main platforming (60-70%), making things feeling more balanced for those wanting a more traditional Crash platforming experience. Bosses are enjoyable, but the the second hub (Ice Burg Lab World) has the weakest bosses while the N. Sanity Island World and Academy of Evil having great boss fights. The one against Dingodile was one of the highlights of the game, having a challenging pattern to overcome and some great music making the fight feel epic. Some bugs do effect the gameplay though at odd points, like the final boss of the Academy of Evil having issues once you run out of ammo for Cortex. It takes a while to refill your ammo and this leaves you open to getting trapped, making death likely. It could just be an issue in my copy of the game though. Another odd bug is that Aku Aku Masks (they return) don’t protect you from TNT and NITRO Crates anymore. The game is a looker, with the PS2 and Xbox versions looking great. They run at 60FPS with tight controls and little slowdown. Animations are the shining show though, as it looks like a playable Cartoon in many cases. Some of them are a bit rough, like a fight with N. Gin being an example this. But overall, the game looks great with many levels having a great color pallet and lots to see and do. N. Sanity Island is a great case for seeing the game in action; lots of AI creatures moving around, a beautiful sun-rise in the sky, and the ocean having ripple effects. Musically, this is one of my favorite soundtracks in the series. Spiral Mouth may be an odd choice, but they fit the Crash series perfectly. Going to list a lot of tracks and highly recommend you listen to them. This is one of the best games in the series to me. It has issues with glitches/bugs at some points and I can see the humor not appealing to some. But overall, it is a really fun game in the series. From its solid level design, strong presentation and a clear sense of passion from TT Oxford behind the project, this is a game I strongly recommend to anyone wanting a great platformer. With the recent announcement of Crash 1-3 HD remakes, would their be any interest in a HD Twinsanity remake in a few years, with extra content, and with the involvement of the original Twinsanity dev team? Because that would be amazing, more so after replaying this gem of a game for this Retrospective. Crash is back and hope this Retrospective celebrates this with style. I definitely loved the artstyle of twinsanity, it’s a huge inspiration. Sorry if i seem a little naggy but grammar is very important! Thank you for the kind words! I picked up on your comment and hopefully the edits fix that issue a bit :). Grammar is important, so thank you for helping me out a bit! without a doubt, my favorite game in the franchise. the visuals, the music, the humor, the characters, the levels, the bosses, ESPECIALLY the gameplay, everything just culminates into a fantastic platformer i’d recommend to almost anyone. i know we just got the n. sane trilogy, but i totally agree with keith webb. time for a twinsanity remaster with all of the cut content! heck, i’d be content with them just porting it as a PS2 classic. reblogged this! 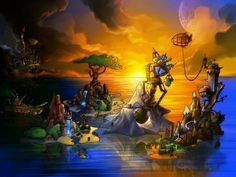 check out this awesome retrospective on what is arguably the best carsh game of all time: crash twinsanity!